Windows 8 File Explorer aka Windows 8 Explorer is the most recent enhanced version of Windows Explorer in Windows 8. File Explorer in Windows 8 has ribbon menu structure which is dynamically created according to the folder properties or file properties. For example, if you click on an executable application file in File Explorer (with its previous name Windows Explorer), Windows 8 users will realize the Application Tools tab in the File Explorer ribbon menu. Application Tools ribbon menu group enables Windows 8 users to pin application to taskbar or run application as administrator (or as another user). Another specialized File Explorer ribbon is Drive Tools. 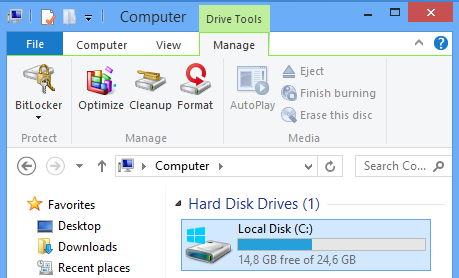 If you browse Computer where you can see disks on your Windows 8 PC, you will see Drive Tools in ribbon menu. Windows 8 Drive Tools enables administators and authorized users to format disk drive, optimize disk for better access performance and encrypt disk using BitLocker tool for a more secure computing environment. 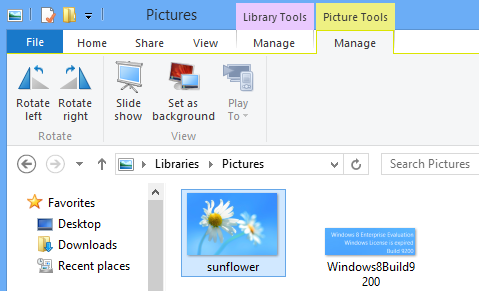 Picture Tools is another ribbon menu group for Windows 8 users in File Explorer. When you browse a folder with pictures included, you will realize Picture Tools menu group when you click on a picture or on a photo. Picture Tools has buttons which rotates image to left or rotate right. Besides these two image edit buttons, another button which displays image files in folder as a slide show is included in Picture Tools group. Windows 8 users can easily set a picture as background of their computer by using the Set as background button in Picture Tools menu. Windows users are introduced with specialized folders called Library which lets easy access to contents of more than one distributed folders. 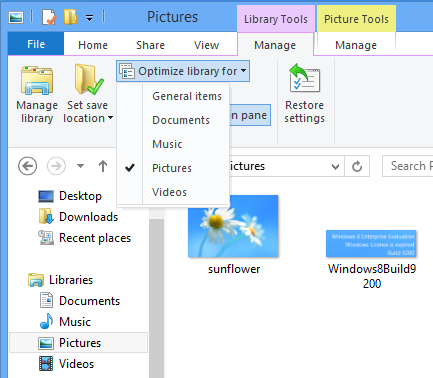 Windows 8 has now Library Tools in Windows 8 Explorer to optimize Windows 8 library for General items, Documents, Music, Pictures or for Videos.